Learning is complex so is creating. Human learning is the combination of processes throughout a lifetime whereby the whole person – body (genetic, physical and biological) and mind (knowledge, skills, attitudes, values, emotions, beliefs and senses) – experiences social situations, the perceived content of which is then transformed cognitively, emotively or practically (or through any combination) and integrated into the individual person’s biography resulting in a continually changing (or more experienced) person. Identify the key components of a number of theoretical approaches. Briefly introduce, say what it is and highlight key concepts. How these might be applied to learning design with technology. Clear RQs that are clearly derived from specific theories. Recommend which data collection processes would be appropriate. Conole et al (2004) x 7: Behaviourism, Cognitive, Constructivism, Activity-based, socially situated learning, experiential and systems theory. 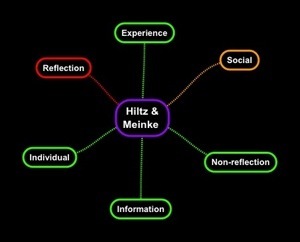 Mayes and de Frietas (2004) x3 Associative (structured tasks), cognitive (understanding) and situative. Beetham (2005) x4: Associative, cognitive constructivist, social constructivist, situative. Etienne Wenger (2007 in Knud Illeris) x9: organizational, neurophysiological, behaviourist, cognitive, activity theories, communities of practice, social learning, socialisational, constructivist. Behaviourism A perspective on learning (Skinner, 1950) reinforce/diminish. Stimulus/response. Aristotle. Hume. Pavlov. Ebbinghaus. Cognitivism Kant, Gagne, Rumlehart & Newman. Activity Theory Builds on the work of Vygotsky (1986). Learning as a social activity. All human action is mediated through using tools. In the context of a community. Knotworking. Runaway object. Useful for analysing why problems have occurred – discordance. See Greenhow and Belbas for RQs. Organizational, Neurophsiological, Behaviourist, Cogntive, Resistence to or defence learning, activity theory, communities of practice, accommodation learning, social learning, transformative learning, socializational, constructivist. Amplification (Cole and Griffin) Amplifying as an increase in output – give a hunter a gun and they kill more prey. Give someone a computer and they write and calculate more. ‘Technology is best understood not as a static influence on literacy practice, but as a dynamic contributor to it’. Learning and teaching: Behaviourism x3, cognitive theories x10 (including constructivism), humanisitc approaches, and others. How these depend on the theoretical approach. 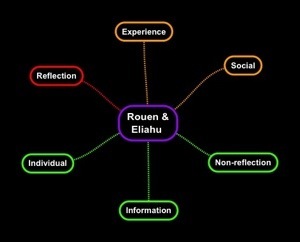 S – Situation, interactions, mechanisms can be more or less collaborative (Dillenbourg, 1999:9). Knowledge always undergoes construction and transformation in use. Learning is an integral aspect of activity. (Conole and Oliver, 2005). Communication is learning. W – Across cultures, not just US and West. Caricatures/simplistic. Not a neat narrative. O – Donations, Funding, Book promotion (MIT). The learner as a unique person. Conole, G; and Oliver, M. (eds) (20xx) Contemporary Perspective in E-learning Research. Themes, methods and impact on practice. When and where could a context NOT be pre-existing?? Something is, or is not. Context is an absolute. Rather, what is that specific context. Otherwise this is tautology. It is like saying that electricity pylons go into an existing landscape. Isn’t this stating the obvious so that a gullible audience nod in agreement? Tolmie (2001) talks of ‘unexpectedly diverse effects’. Unexpectedly or diverse? Surely not both. Is this not something of an exaggeration? And in any case, such diverse responses should be either expected, or not presumed either way to be likely or unlikely to happen. It is very dangerous to pre-empt findings. I visualise the introduction of new technology such as this as drops of ink in a pool of water in a stream – it has to compete with the mix that is already there, as well as its natural flow and other behaviours – leaking away into the land and evaporation for a start. My conclusion based on reading the abstract is to: Think people above all else. Internal and external contexts are fluid and based on responses too and feelings. It is all complex, and more to do with the brains of the individuals than simply their context . Everything can and should be measured in some way, from an agreed benchmark, to monitor, track then analyse. It is far more complex. The expression ‘oversimplified’ used by Tolmie (2001) is a) hyperbole b) a value judgment. How else do you address improving a situation other than by identifying the problems? Anything else is misguided (literally), or indulgent. Far worse, in the NHS, and Post Office and Banking System have been wholesale computing systems that really were alien and universal. Making the wrong assumptions that blame the teachers rather than the technology – which is a catalyst for complexity, rather than a tool for conformity. Evaluation work also rarely does more than examine the explicitly intended effects of ICT, and so fails to identify unintended or serendipitous repercussions that may actually be a critical aspect of its impact (Jones, 1998). But the entire point and context of an exam is to remove such context in the surroundings by placing the student in ‘exam conditions’ in a neutral space, where parameters of time and context are controlled and aim to be common to other students and impartial. Surroundings mean different things to different people. It is naive and deterministic to think that people are so easily governed by their context. The individual over the surroundings. 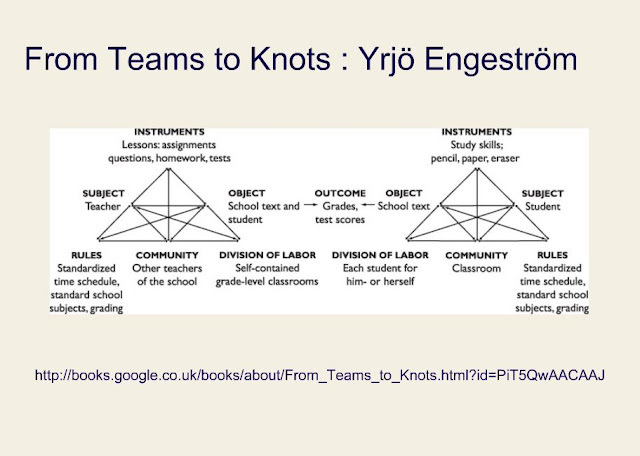 Unless we think students are like a uniform tribal grouping. I’m through the reading and taking it further – reading the original paper to see if my concerns and amusement are justified. I find the gender difference uninsightful and unhelpful – we know this anyway. Men and woman are different physiologically – which includes the brain where there are various documented differences especially between the differing amount of grey and white matter and the concentration of neurones and close connections in women compared to men. But the differences between men and women are not black and white (and their are not racial differences whatsoever) … within these differences there is considerable variety. Now add each person’s context – which for me starts a few months after conception and every possible influence since – the same chaos theory that says that when a butterfly beats its wings in the Brazilian Jungle there is a typhoon in Malaysia will suggest that that marshmallow your grandmother gave you on Christmas day when you were six while watching Jimmy Saville introduce the Chart Show will influence how you respond to the 14 year old boy you have been paired up with in a physics class who offers you a handful of mini-marshmallows by way of ‘making friends’ who in turn is nervous about this strange but beautiful creature who he hasn’t noticed all year but rather fancies even though his older brother has his eye on her – what was that the teacher said checking the trajectory of your balls on the computer ????? I will change my opinion as I go through my notes but my current stance is that a quantitative before and after study requires many hundreds of participants in a randomised controlled trial and the gender differences are a distraction – far better to have administered questionnaires before and after and drawn upon each students SATS results or some such to get some sense of where they were coming from in relation to physics. More interesting pairings would be like-minds and enemies – really. A couple of buddies having a laugh might learn less than a pair who can’t stand each other, or another pair who are rivals. Have I been watching too many teen movies? Probably. Already I have a script in my head based on Tolmie in which far from being the less talkative, the FM pairs are chatting away to themselves (in their heads, written and delivered as stream of consciousness voice over), communicating in subtle ways through body language and as a result actually communicating more, not less than the ones who won’t shut up – and who may be playing up to the research conditions. This is the other fundamental humdinger of a problem – these students are being tested under ‘lab conditions’. My memories of teenager physics classes are more akin to St.Trinian’s with boys. I even have a diary to call upon which I may look at just to get me into the role. I have a household of teenagers and another five nephews and nieces in this age bracket if I need to be reminded of what it is (and was) like. Oddly enough, work is often the last thing on their minds. Which is why homework is so important – fewer potential distractions. This will be less than hearsay in due course – I am also refreshing what it was and is like to be a teenager through some additional reading. Problem is my daughter senses that I am observing her from time to time. I’m just asking myself the same question I asked when she was born, ‘what is going on in there?’ – but in a quasi-academic rather than father-daughter way. Researchers make the mistake of believing that their intervention – in this case using a computer to support a physics class by trying to prompt discussion – is going to make some measurable difference. Can they not see the bigger picture, and how vast it is? If each human brain has as many neurons in it as the visible galaxy – 98 billion, and each brain though similar, is connected in different ways, by gender but essentially by genetics, with every remembered moment of waking and sleeping life in between. This is why, to have something measurable, researchers taken to the lab and until recently would have stuck with sea-snails, rats and in the past cats and primates … while gradually observation and measurement of electro-chemical activity in the human brain has become possible. When it comes to exams surely examiners know that the response to a unique set of questions in an exam, certainly at undergraduate level, if not at post compulsory level, will test the student’s ability to construct a response both from what they know, and what they have to surmise. Oliver, M. & Conole, G. (1998) Evaluating communication and information technologies: a toolkit for practitioners. Active Learning, 8,3–8. Robinson, H., Smith, M., Galpin, F., Birchall, D., Turner, I. (1998) As good as IT gets: have we reached the limits of what technology can do for us? Active Learning, 9, 50–53. Tolmie, A. 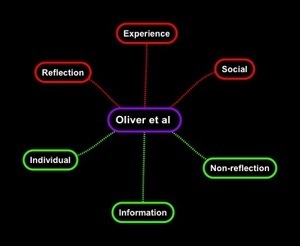 (2001), Examining learning in relation to the contexts of use of ICT. Journal of Computer Assisted Learning, 17: 235–241. doi: 10.1046/j.0266-4909.2001.00178. This is an activity in week 7 of Open University postgraduate module H809: Practice-bases research in e-learning which forms part of the Masters in Open & Distance Education. Shared here, as in my student blog, in order to invoke discussion. I’ve successfully completed the MAODE so this is something of a ‘bonus track’ (I graduate in April then look onwards). The activity is drawn from the Conole et al paper referenced below. Theories are catergorised and a model produced to help define the learning theories that can be identified. What concerns me is the belief that theories of learning, which academics have identified in education in the last 90 years, are either key drivers or influencers in the design of learning. Surely these are all observations after the event. Like trying to analyse a stand-up comedy routine using a set of plans and parameters – ‘Good Morning, Vietnam‘ comes to mind. As, I suppose would ‘Dead Poets Society‘ to bring in Robin Williams again. Was the Khan Academy a product of such analysis? No? An investment banker wanted to help his nephews out with their Math so he recorded some videos. Actually, I just realised my wife is doing this for a friend’s daughter who is learning French – creating bespoke French language pieces for her to practice on. I can’t even think what either of them are – behaviourist or social-constructive and experiential. I’m afraid, given what the academic ‘gurus of e-learning’ keep coming up with they are probably the least intuitive or inventive because their hands and minds are tied by this kind of thing. Just my forming and fluid opinion. If I want to develop a platform or school that uses e-learning I’ll go find myself a ‘Robin Williams’ kind of educator – someone has a natural flair for it, who engender a following, who most importantly delivers extraordinary results. Looking back at school I know that what motivated me was two fold – my own long term goal and the quality of an inspired and informed teacher who had tutoring, moderating and teaching in their blood. There’s a reason why research and teaching don’t mix. I’ve asked some academics about this and they have told me that they haven’t gone into the commercial sector, nor do they teach … ‘because they hate people’. Where in these theories is the person? This relationship, the rapport that can form between tutor and student is what is lacking and it is why, in my opinion, the likes of the Oxbridge Tutorial, that one to one, or one to two or three hour long session once a week is far, far, far from dead. Neuroscience is going to blow this allow out of the water. Already the shift is very much in favour of genetics and the way our unique brains are formed as we develop as a foetus. It is nature, not nurture, so frankly, we can have anything thrown at us in terms of life experience and how we learn and how we respond will remain individual. This is the perspective of my father in law whose secondary education was the being in the Polish resistance during the Second World War, his first university a prisoner of war camp. He had England or the US as choices having decided not to return to Poland. And found himself learning English in Gateshead. The story continues … so what kind of learning was occurring in the POW camp? He bartered lessons in German for lessons in English. Not that it can be injected into a class, and even less so in online learning, but ‘fear’ doesn’t half help turn a short term memory into one that will stick. Playing Devil’s Advocate, can ‘e-learning’ only ever be ‘cotton wool’ the safest, tamest learning you will ever receive? Try reading an essay out in a tutor group – there’s fear! Try getting up in a hall of 300 people to make your point in a debating chamber – terrifying. An odd conclusion to reach at the end of this reflection on the exercise – but where is the ‘fear’? And I mean the right kind of fear, not the threat of the cane or other such punishment, but the fear of letting you down, or your side down, or of humiliation … against the public reward if you get something right? Pinned down in a collapsed cellar in Warsaw my father in law believed he would die. He was the only one alive. Everyone else had been flattened. By some chance he had been standing under a beam that had partially protected him. He made promises he’d keep if he lived. He was found. A smash to the head. Does learning have more impact when there is something at stake? Try introducing this element into an e-learning module. The impossible hypothesis – people learn better and make decisions with firmer convictions, where their life is at stake? Then again we turn to neuroscience and will conclude that some will, some won’t, that the response of the individual to a shared experience means that you get as many different outcomes as there are people. Institutions think that grades divide students – that’s only the tiniest fraction of what makes each person in that class different. If the student isn’t suitably self aware to know how to play to their strengths and managed their weaknesses then the observant tutor and others who are part of the institution should be doing this on their behalf – as parents, friends and siblings might do. The ‘Flipped classroom‘ for me is finding ways to work with the individual who happens to be in a class that is probably already sorted by age and culture, if not also social class and gender. Maybe the classroom has had its time. A short-lived interlude in human development over the last 70,000 years. Conole, G, Dyke, M, Oliver, M, & Seale, J (2004), ‘Mapping Pedagogy and Tools for Effective Learning Design’, Computers And Education, 43, 1-2, pp. 17-33, ERIC, EBSCOhost, viewed 25 March 2013. In this paper from Grainne Conole she says (writing in 2003, published 2004) that wireless, smart and wifi will have a huge impact … prescient. Can you remember how little of what we now take for granted was around in 2004? I was probably using a Psion and a bog-standard phone. This is what you find in the press, newspapers and magazine always go for the anecdotal and sensationalist view of what technology may do. Has technology yet brought the world to an end? I guess the atomic bomb has always, legitimately, been more scary than other technologies although I dare so there are those who say Google will bring about the end of the world. A better understanding of the benefits and limitations of different methods. How technologies can be used to improve the student learning experience. Or as I would say, ‘on verra’. Whilst the research question ought to come first, I hope that Activity Theory will have a role to play too. If anything has been written on blogging I want to read it. On 27th September 1999 I posted to my first blog – it was on blogging and new media. We’re now in the phase of transition that took the printed book after the Gutenberg Press some 400 years. The clunky blog of 1999 barely compares the variety and scope of what we still call a blog today. This rightly questions when and where blogging should be an endeavour to use with students. Exploring students’ understanding of how blogs and blogging can support distance learning in Higher Education (2007) Kerawalla, Minocha, Conole, Kirkup, Schencks and Sclater. Based on this research blogging is very clearly NOT of interest to the majority of students, NOR is it likely to be of value to them for collaborative learning. There may be value in blogging for your own sake – aggregating content in one place. (Research on using blogging with students of Public Relations gives a far more favourable response … I would suspect that this would apply to courses on journalism and creative writing i.e. use the medium that is appropriate for those on specific courses). This is a study of OU students. A more promising, and appropriate study I am looking at concerns PR students who a) need to develop their writing skills b) need to understand what blogging is all about. The greatest value I have got from this self-inflicted exercise is to deconstruct the research that was undertaken should I wish to undertake research of this ilk myself. Can I fault the research? Problem Does blogging support student in their learning or not? Are educators perceptions of the positive uses of blogging for learning borne out by the perceptions of and uses of blogging by students? Questions QQ Designed to ascertain their level of experience of blogs and to gather their opinions about how blogs (and other tools) could support their learning. 1) What degree of blogging experience do students have? 2) Do students want to have blogging as part of their course? 3) In what ways do students think blogging is (not) a useful learning tool? 4) Is there a disparity between what course designers think blogging is useful for, or would like blogging to be used for, and students’ opinions of usefulness? All questions required students to select their response by clicking on a radio button, (e.g. ‘yes’ or ‘no’, or Likert scales such as ‘not at all’, ‘slightly’, ‘in-between/no opinion’, fairly’, or ‘very much’). (Kerawalla et al. p. 6. 2007) + an open question for expanded thoughts. Interviews with course designers – Interview questions were designed to address the following areas: the rationale for introducing blogs, whether blog content would be assessed, whether blogging was compulsory, uptake levels and whether there were any plans to evaluate the success of blogging activities. – extract, collate and compare. Analysis – The survey generated both quantitative and qualitative data. reduce sense of isolation (Dickey 2004). knowledge communities (eg Oravec 2003). i.e. Not everything they’re cracked up to be. Krause (2004) reports haphazard contributions to blogs by his students, minimal communication between them, and found that posts demonstrated poor quality reflection upon the course materials. Williams and Jacobs (2004) introduced blogs to MBA students and although he reports overall success, he encountered problems with poor compliance as, for example 33% of the students thought they had nothing valuable to say in their blog. an ability to manage the tension between publishing private thoughts in a public space (Mortensen and Walker, 2002). Paradigms A cultural psychological approach to our research that proposes that learning is a social activity that is situated and mediated by tools that fundamentally shape the nature of that activity (e.g. 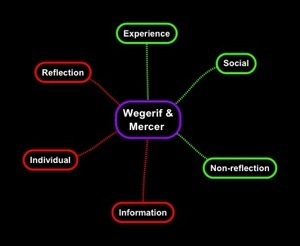 Cole, 1996, Wertsch, 1991 and Vygotsky, 1979). Limitations Expectations about sharing, enthusiasm for the genre …definition of blog (see e-portfolio and wiki), journalism …. hard to define (Boyd, 2006). They mean different things to different people. Uses to collate resources (portfolio) (Huann, John and Yuen, 2005) , share materials and opinions .. (Williams and Jacobs, 2004). 35% thought that commenting is ‘fairly’ or ‘very’ useful. only 18% said that they thought blogs would be ‘fairly’ or ‘very’ useful. of those who blog only 205 of these thought blogs would be ‘fairly’ or ‘very’ useful. Students were asked ‘how much would you like to use a blog provided by the OU for personal use?’. Examination of the observed and expected frequencies for this data suggests that in both cases, there is a relationship between not seeing a role for blogs and not wanting greater use of conferencing. Supporting findings that when given a choice between classroom based learning or e-learning those who have a choice are equally satisfied by what they get. All of the positive responses refer to the students’ own (potential) study blog. (Kerawalla et al. p. 7 2007) Others use their blog as a repository. Few saw the benefits of linking or using a blog to for reflection and developing ideas. Responses to the question ‘would you like a blog provided by the OU to support your studies?’ reveal that there is a profound lack of enthusiasm (from 82% of the sample) for blogging as part of courses. Cole, M. (1996) Cultural Psychology. Camb. Mass: The Belnap Press of Harvard University Press. Kerawalla, Lucinda; Minocha, Shailey; Conole, Grainne; Kirkup, Gill; Schencks, Mat and Sclater, Niall (2007). Exploring students’ understanding of how blogs and blogging can support distance learning in Higher Education. In: ALT-C 2007: Beyond Control: Association of Learning Technologies Conference, 4-6 September 2007, Nottingham, UK. Vygotsky, (1979) Mind in society: The development of higher psychological processes. M. Cole M, V. John-Steiner, S. Scribner and E. Souberman (eds and trans). Cambridge, MA: Harvard University Press. Wertsch, J (1991) A sociocultural approach to socially shared cognition. In L.Resnick, J. Levine and S. Teasley (eds), Perspectives on Socially Shared Cognition, Washington: American Psychological Association. Digital Scholarships Considered: How New Technologies Could Transform Academic Work. 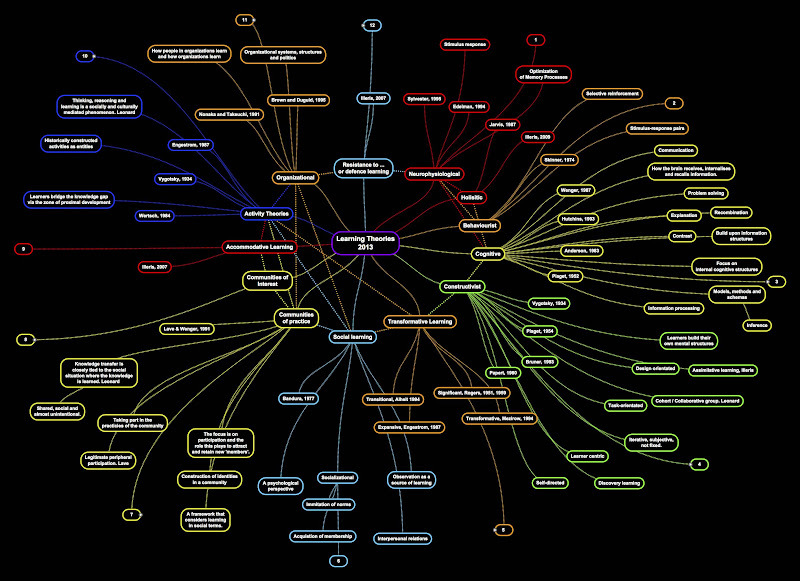 Where the biggest impact of digital technologies and open approaches. Openness and transparency are significant drivers of change in education. Boyer, E.L. (1990) Scholarship reconsidered: Priorities of the professoriate. Princeton. N.J. Carnegie Foundation for the Advancement of Teaching. Shields, M.A. (ed) (1995) Work and Technology in Higher Education: The social construction of academic computing. I did a search in my own blog knowing that somewhere I cited an academic who described blogging as ‘whatever you can do on electronic paper’. Chatting about this at dinner my 14 year old son trumped my conversation with his mother as I tried to define a blog and what can go into one with one word ‘anything’. My starting place is here. This ‘eportofolio, writers journal, aggregating, dumping ground, place for reflection and course work’. You see, is it a blog at all? This platform, I’m glad, has its design roots in a Bulletin board. The limitations of our OU Student Blog platform works in its favour. I can only put in two search terms. In Google I might write a sentence and get a million links, in my wordpress blog it might offer have the contents. Here I search ‘blog paper’ and get 112 posts that contain both words. I’ll spin through these an add a unique tag. My starting place. But to study blogging would be like researching the flotsam and jetsam that floats across our oceans – after a tsunami. Starting with a book published in 2006 ‘Use of Blogs’ I want to read a paper ‘Bloggers vs. Journalists’ published in 2005. A search finds richer, more up to date content. Do I even bother with this first paper? (ironic that we even call them papers). I can’t read everything so how do I select? Toggle through the abstract, check out the authors, see where else such and such a paper has been cited. Use RefWorks rather than my habit to date of downloading papers that MIGHT be of interest. Whilst storage space is so inexpensive it is virtually free there is no need to clutter my hard drive, Dropbox or Google Docs space. Which makes me think of one of my other favourite metaphors – kicking autumn leaves into the breeze. That or drowning in info overload, or as the Robert de Nero character in Brazil, Archibald ‘Harry’ Tuttle, who vanishes in a pile of discarded paper … my mind wanders. We do. It does. I stumble in the OU Library as I find I am offered everything under the sun. I am used to being offered academic papers only. So far all I’m getting are scanned images of articles in newspapers on blogging. All feels very inside out. Where’s the ‘turn off the printed stuff’ button? I fear that just as I have never desired to be a journalist, preferring the free form of your own diary, letters, and of course blogging and forums online, I will struggle to write within the parameters of an academic paper. I’m managing assignment here, so I guess I’m learning to split the two. A useful lesson to have learnt. Is this a research methodology? I am looking at a book on blogging, ‘Use of Blogs’ (Bruns & Jacobs, 2006). I have it open on p.31 Notes (i.e. references) for the chapter Journalists and News Bloggers. As I pick through these articles, papers and reviews written between 2002 and 2005 I find several of the authors, a decade on, are big names in the Journalism/Blogger debate. It’s as if I am looking at a tray of seedlings. It strikes me as easier to start in 2006 with 27 starting points when the field of debate was narrow, rather than coming in from 2013 and finding myself parachuting into a mature Amazonian jungle of mixed up printed and digital, journalism and blog content. Druckerman, P (1999) Ellen Levy Has Got The Write Project For the Internet Age — It’s a Year of Scribbling Down Almost Everything; Ah, Yes, It Was a Raisin Bagel, New York, N.Y., United States, New York, N.Y.
Then I’d been reading blogs for a few months but had a mental block with uploading HTML files and then along came the first ‘ready made’ DIY blogging platforms. The last 12 years makes amusing reading – particularly the battle between journalists and bloggers. And who has won? Is there a difference anymore? Journalists blog and bloggers are journalists and entire newspapers are more blog-like from The Huffington Post to the FT … which within three years will close all its print operations. A blog therefore becomes ‘an active demonstration of learning’ with cumulative feedback. I’ve only received ONE Tutor comment in my OU blog and that was to say why was I blogging and not getting on with my TMA. This person had their head so stuffed inside primary school education of the 1960s it made me feel like tossing my cap in the air. ‘Bloggers vs. journalist: The next 100 year War?’ 2011, Public Relations Tactics, 18, 4, p. 17, Business Source Complete, EBSCOhost, viewed 18 February 2013. Bruns, A. Jacobs, J. (2006) Use of Blogs. Kerawalla, L, Minocha, S, Kirkup, G, & Conole, G (2009) ‘An empirically grounded framework to guide blogging in higher education’, Journal Of Computer Assisted Learning, 25, 1, pp. 31-42, Academic Search Complete, EBSCOhost, viewed 18 February 2013. Rosen, J. (2007) ‘Web Users Open the Gates’, Washington Post, The, n.d., UK & Ireland Reference Centre, EBSCOhost, viewed 18 February 2013.